Consistent with Department of Energy (DOE) standards, the PHII weatherization and energy auditing courses train building science professionals to see the home as a complete system. 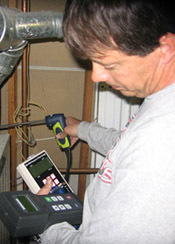 Students who complete the courses understand what is required to audit and weatherize a home as well as the impact of those changes on other aspects of the home. Weatherization Assistance Programs, funded federally through DOE, expect to provide services to 100,000 low income homeowners this year. These homeowners generally pay a disproportionate amount of their income on basic energy expenses and are often living in the homes most in need of remediation. Select your state from the list of State Weatherization Agencies to find agencies in your area that provide weatherization assistance.